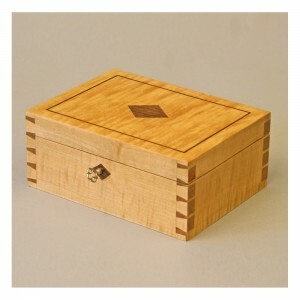 Here are some examples of my work. 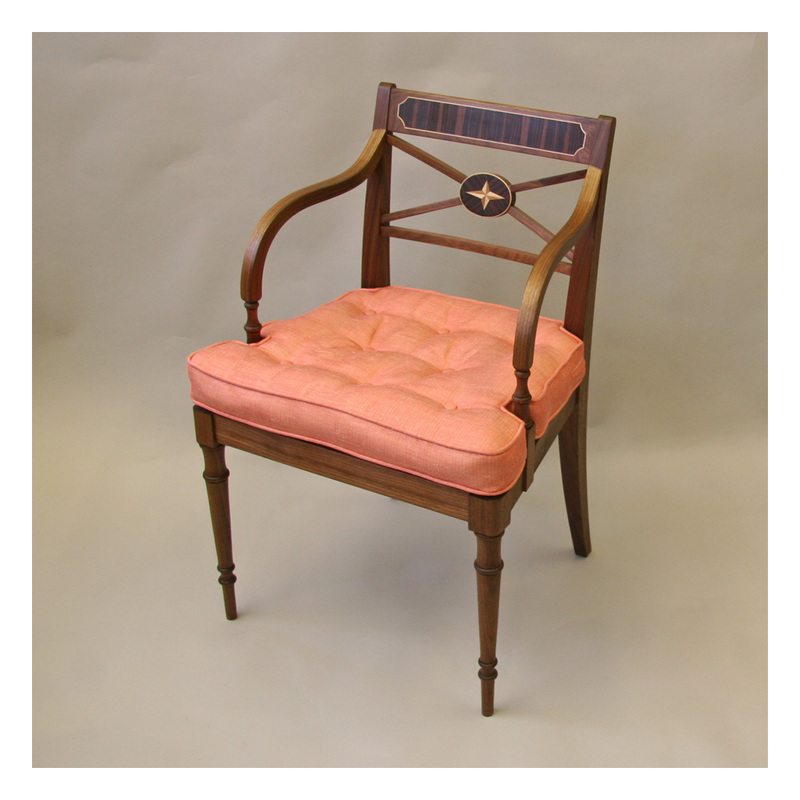 As you will see, these are quite varied. 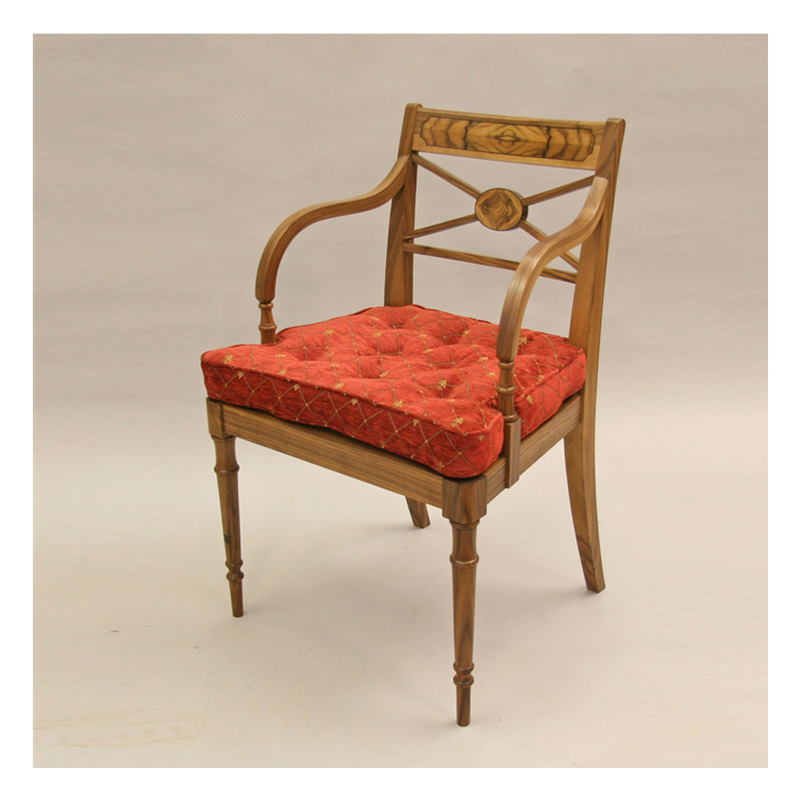 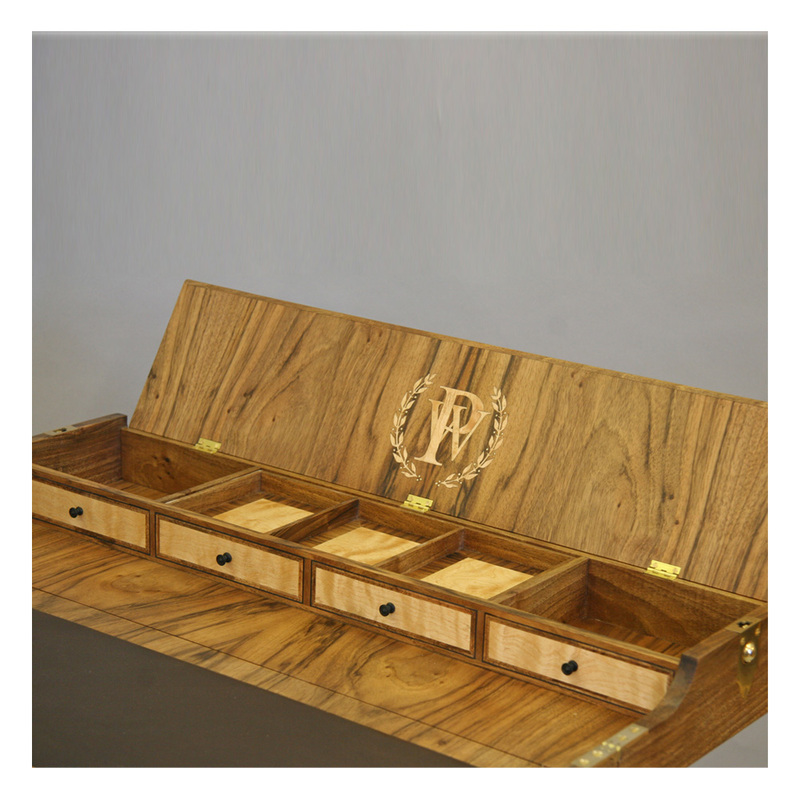 As a rule I tend to favour the classic designs found in traditional English furniture, using a combination of solid wood and veneer to showcase the natural beauty of the wood. Hover over each image for a description, and click on each image to enlarge it. 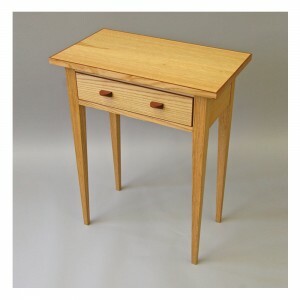 The campaign desk folded, for easy portability. A detail of the campaign desk, showing the monogram of the person for whom it was made (my wife Penny). 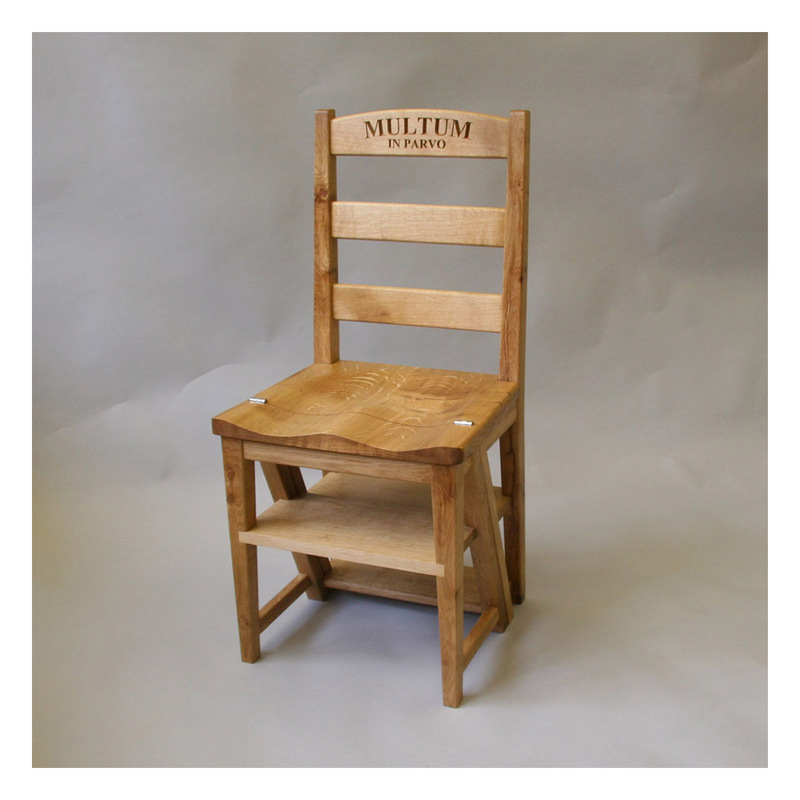 This chair is made of American black walnut, with English walnut veneer. 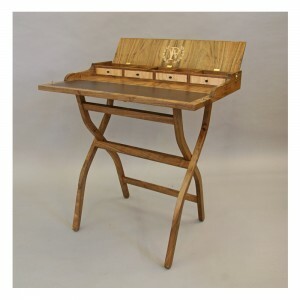 It was designed to be used with the campaign desk and has a caned seat for lightness and portability. 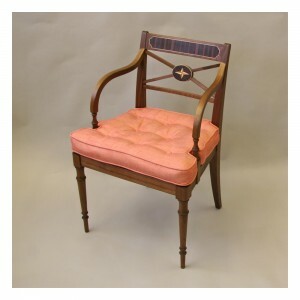 A detail of the carver chair, showing the quartered veneering on the chair’s back. This child’s chair was made as a Christening present. 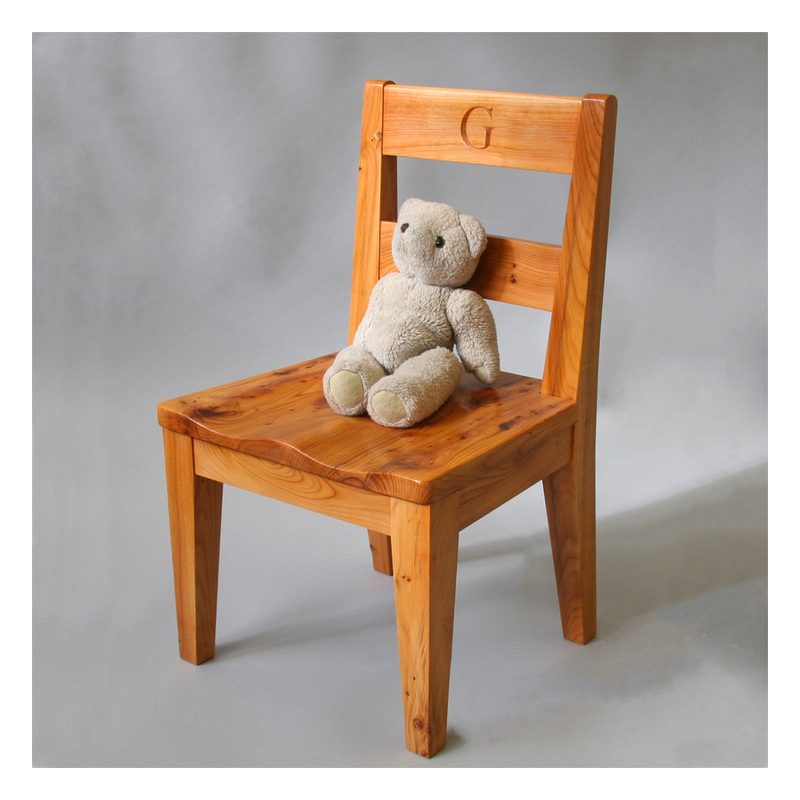 It is made of yew and has a shaped seat. 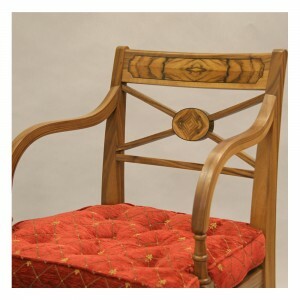 The child’s first initial has been carved into the cresting rail. 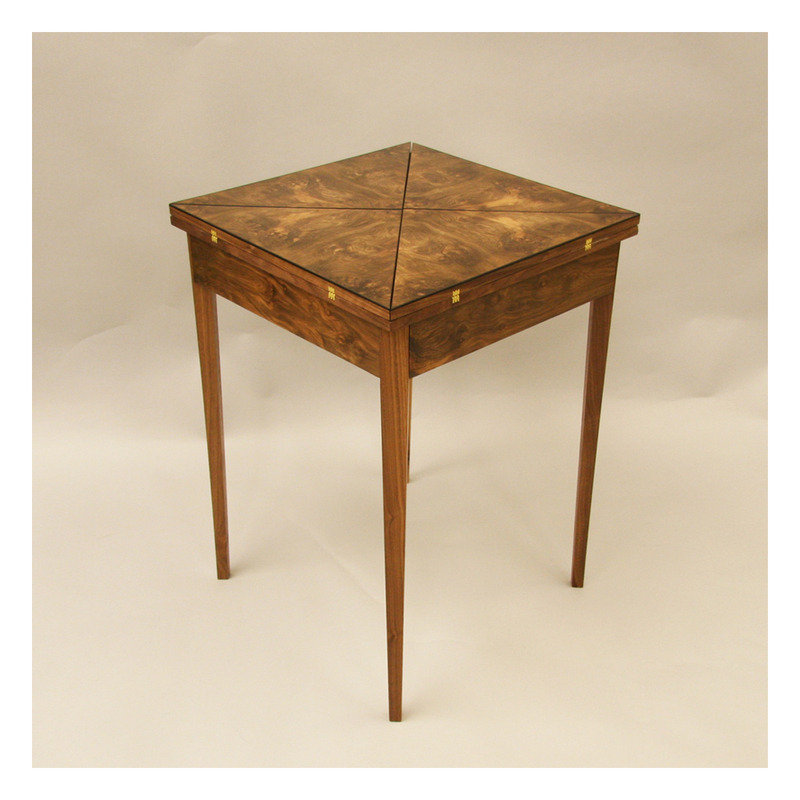 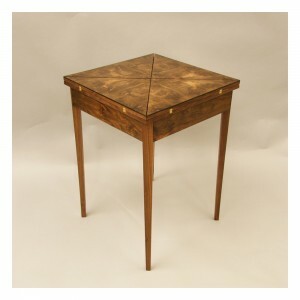 An envelope card table veneered in English burr walnut with ebony edging. 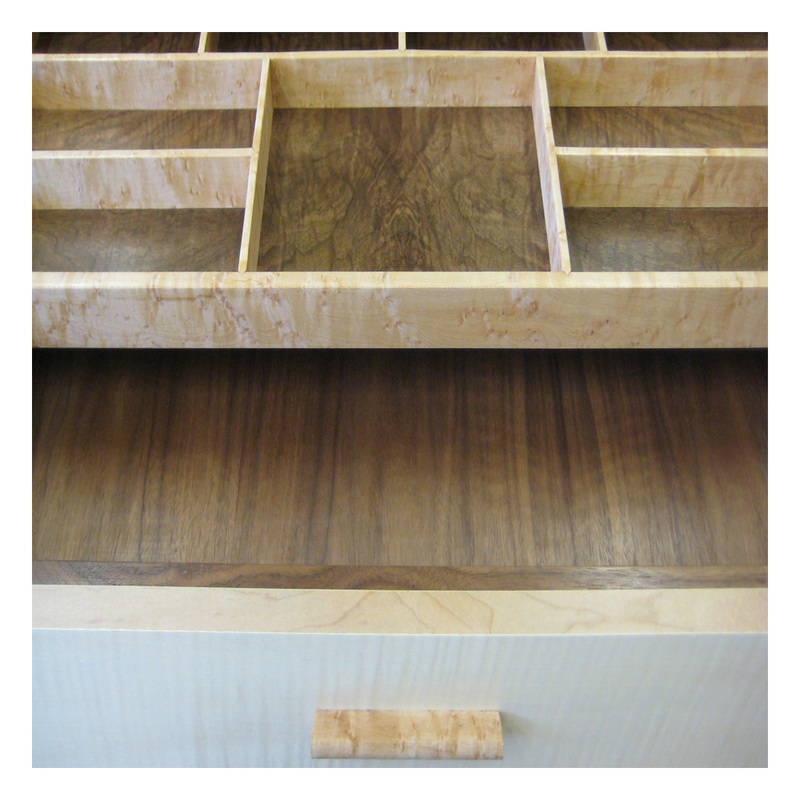 The base contains two drawers. The quartered veneer on the top of the card table. 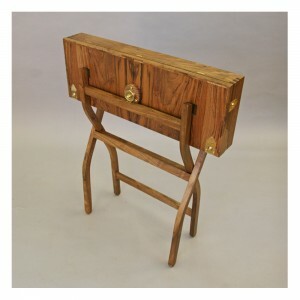 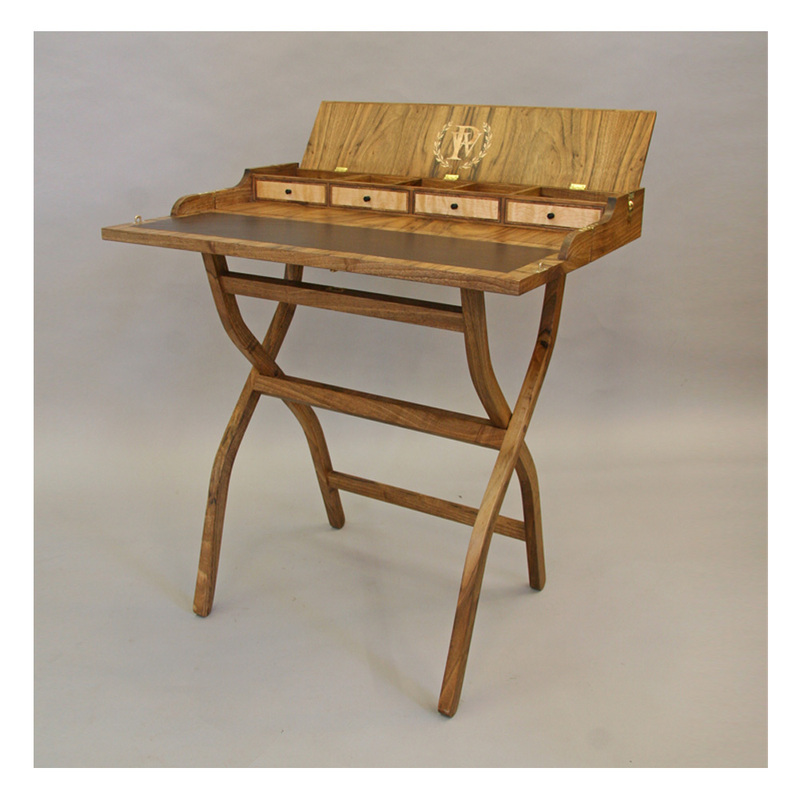 A folding campaign desk in English walnut with walnut and birch veneer and a leather writing surface. This picture shows the card table opened. 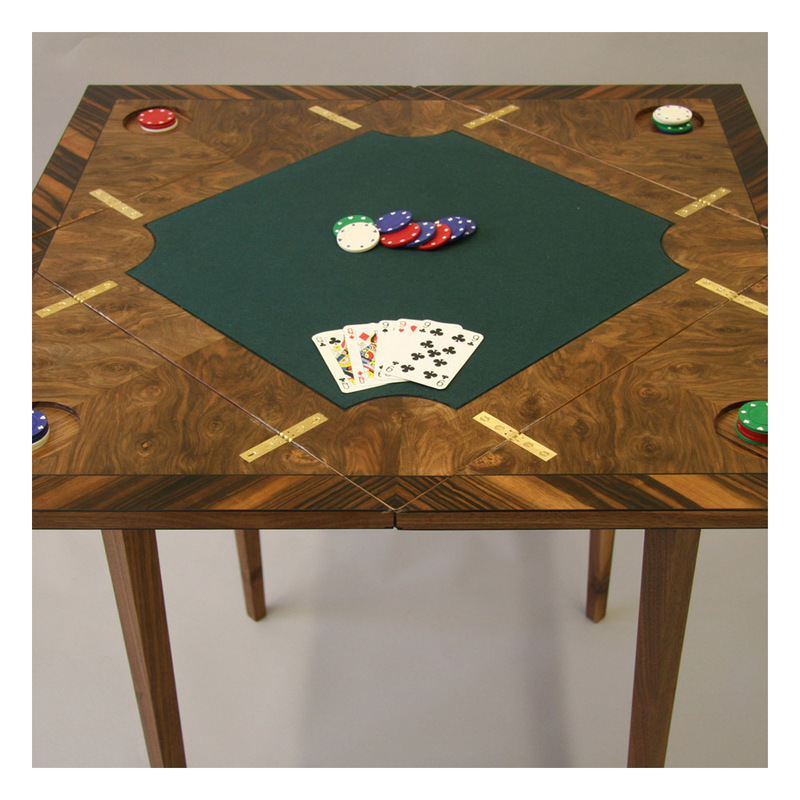 The baize is surrounded by English burr walnut veneer and Macassar ebony crossbanding. 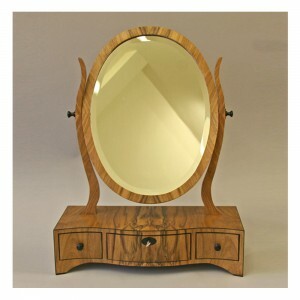 A serpentine-fronted dressing table mirror veneered in English walnut with ebony edging and drawer pulls. A detail of the dressing table mirror. One of the drawers contains a concealed compartment. 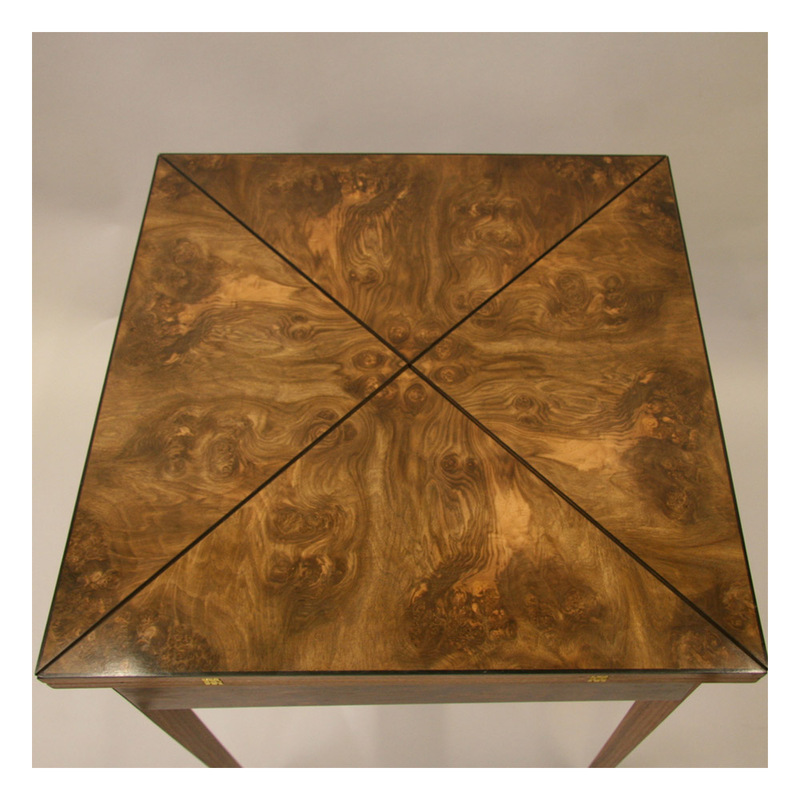 This occasional table is made of chestnut. It has leopardwood edging and drawer pulls. 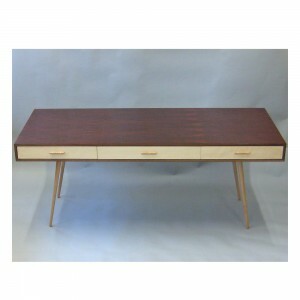 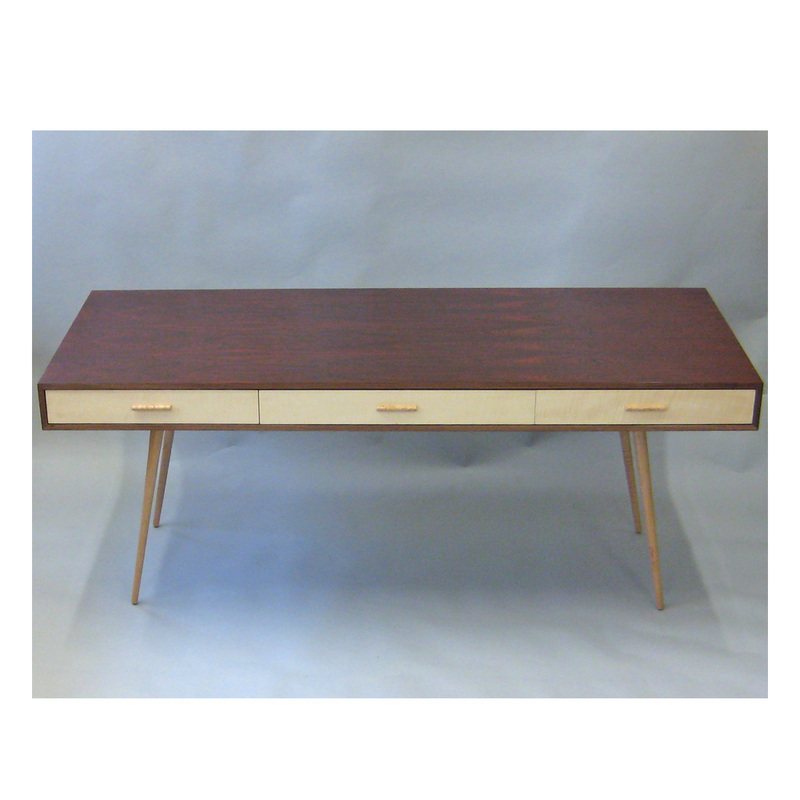 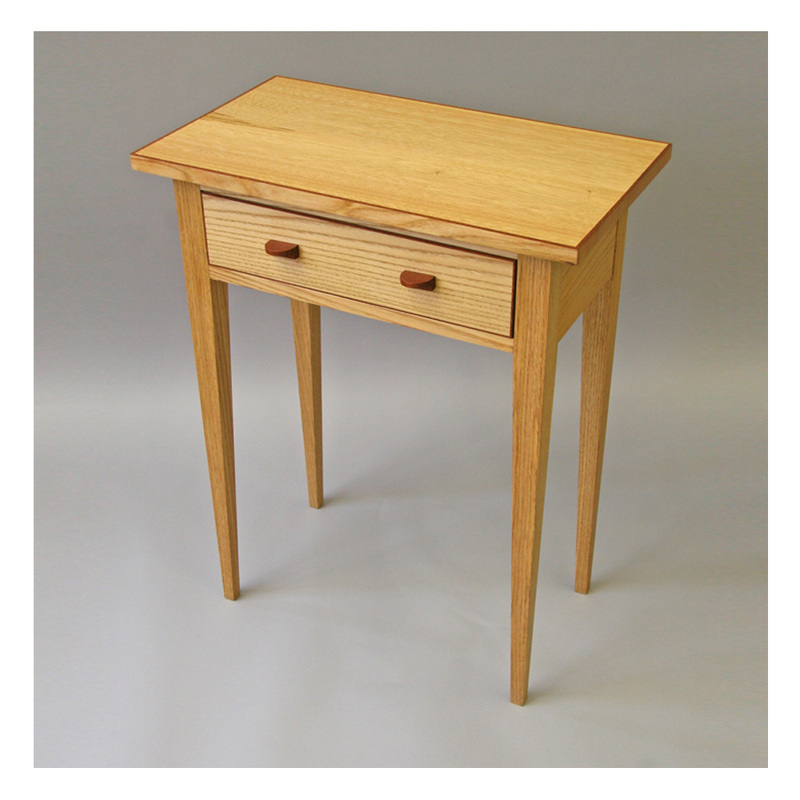 A desk in cocobolo, with ripple sycamore legs and drawer fronts. 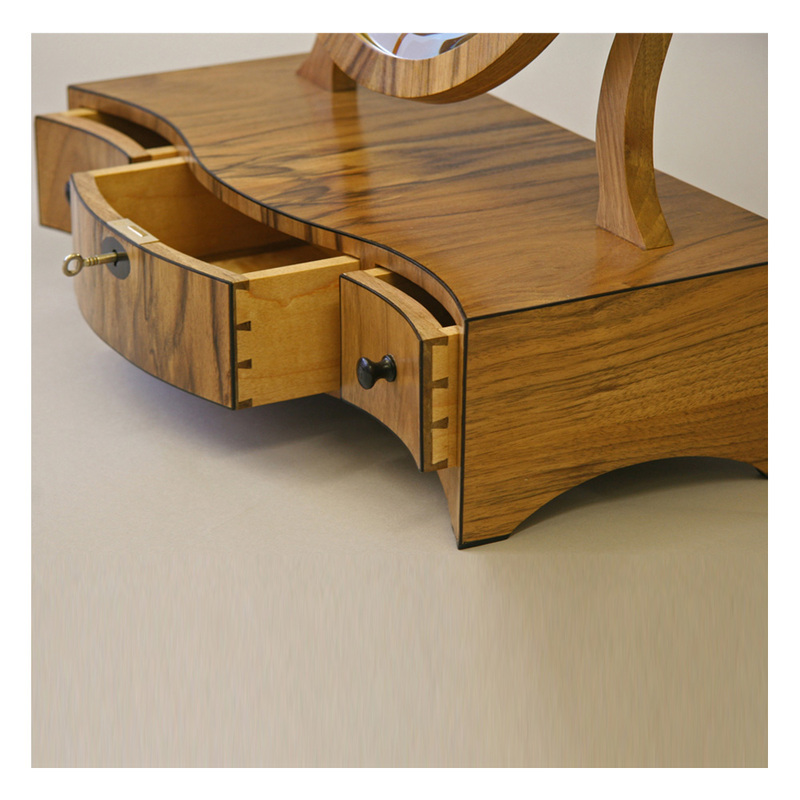 A detail from the central drawer of the cocobolo desk. 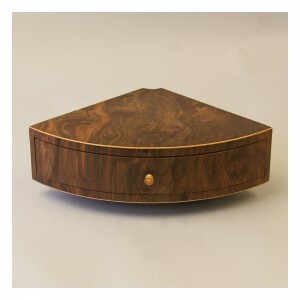 This contains a sliding tray of bird’s eye maple and burr walnut. 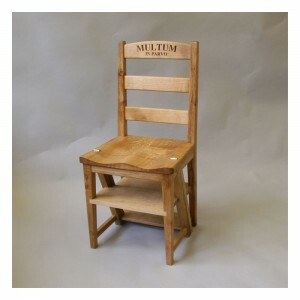 A ‘metamorphic’ chair made from English oak. 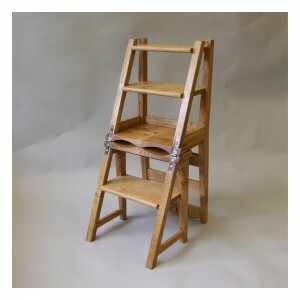 The back of the chair hinges forward to convert into library steps. 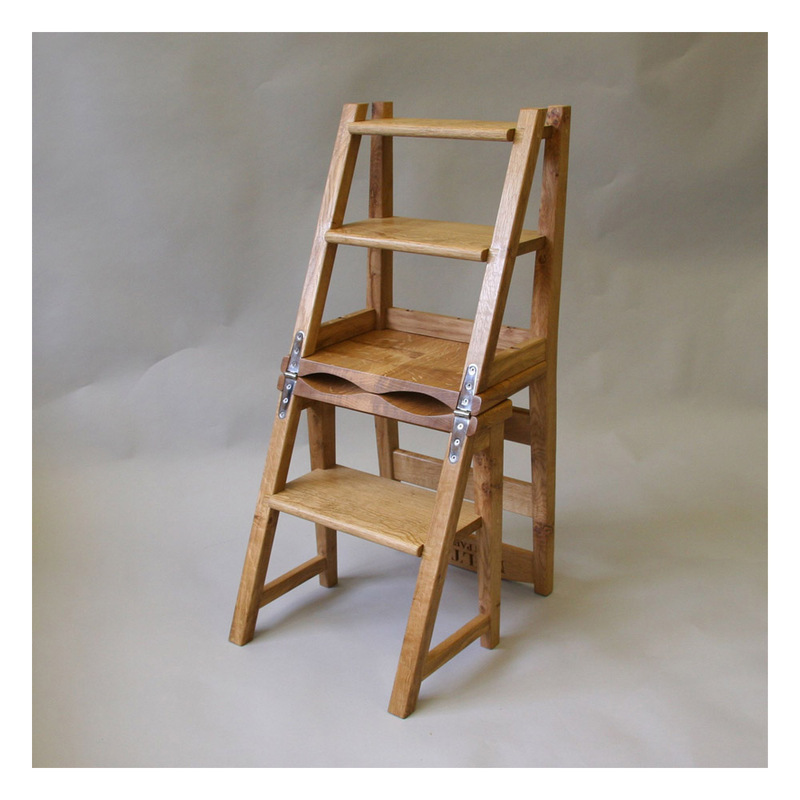 The ‘metamorphic’ chair as converted into library steps. 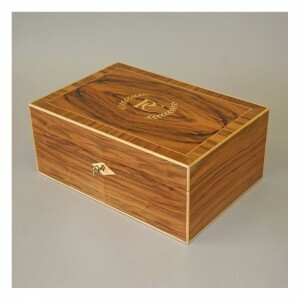 This humidor was commissioned as a 70th birthday present. 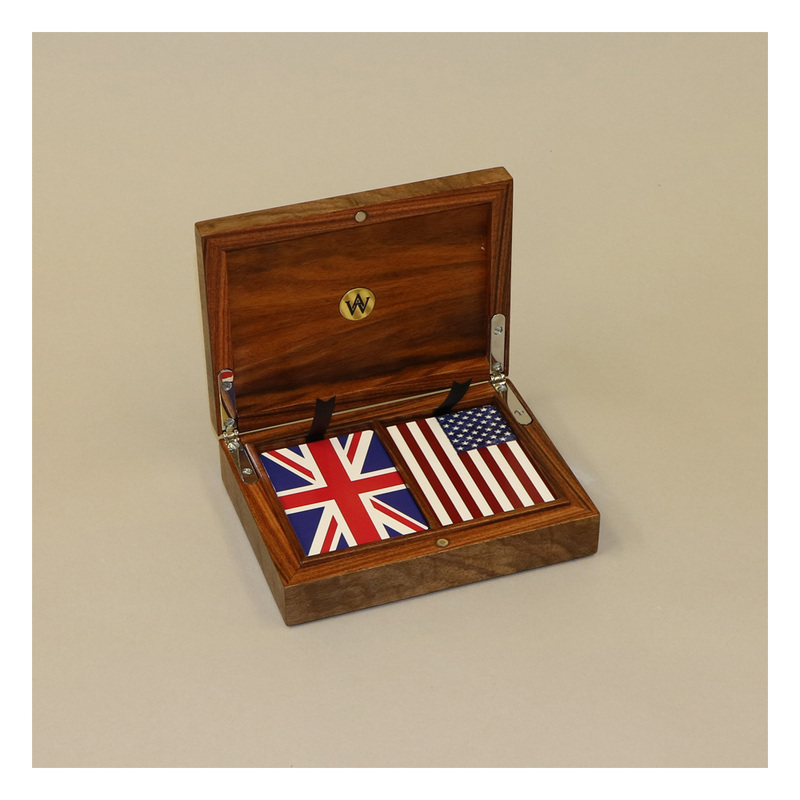 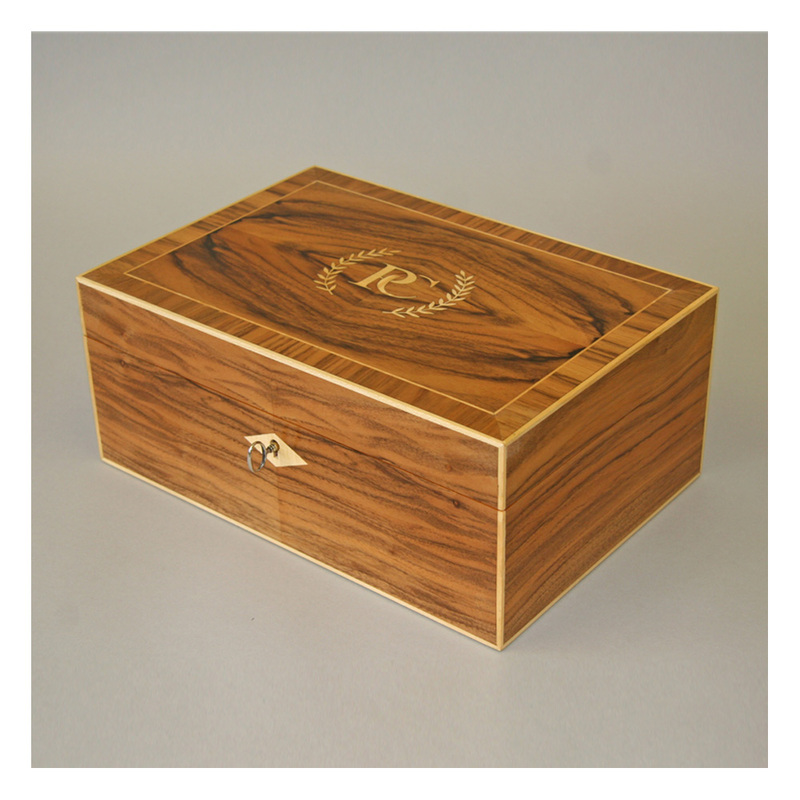 It is made of cigar box cedar and veneered in English walnut with maple inlay. The interior of the humidor is lined with untreated cigar box cedar. This jewellery box is made of Bolivian rosewood and has mother-of-pearl inlay. 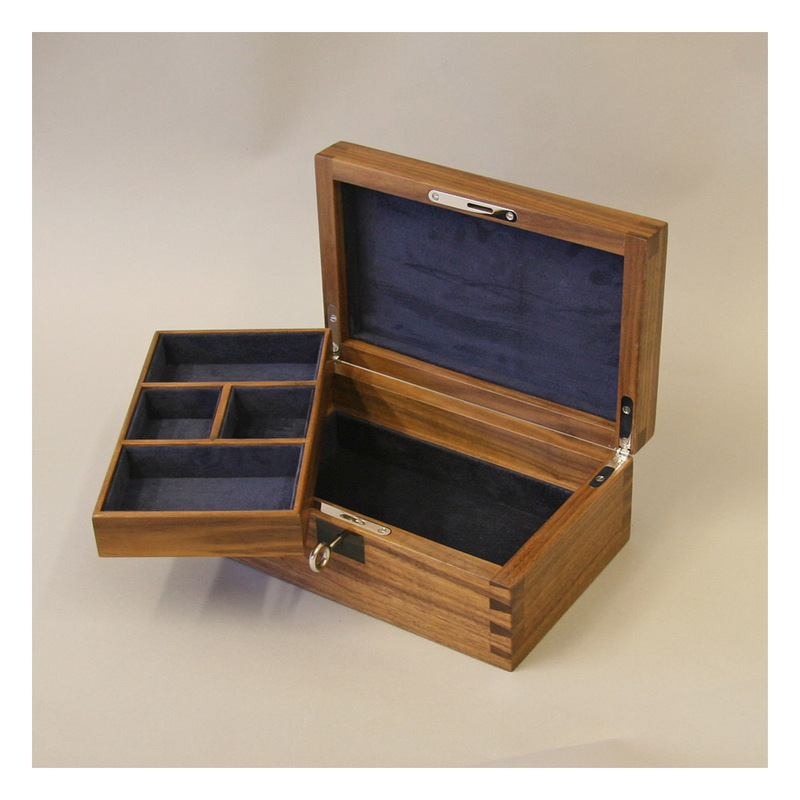 The jewellery box interior, showing the tray lined with doeskin. 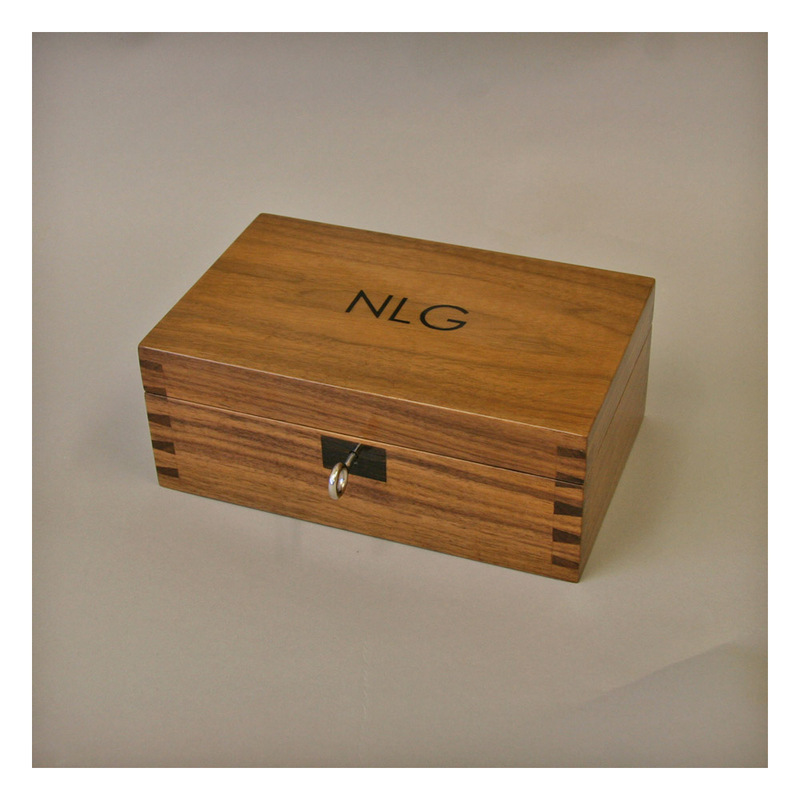 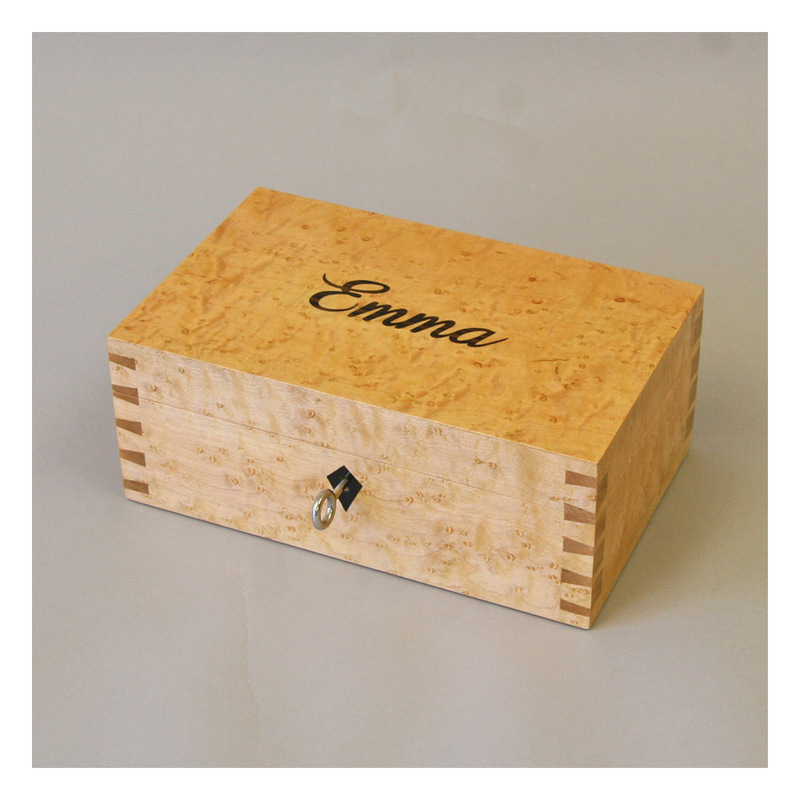 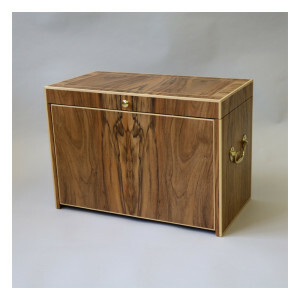 A jewellery box in sycamore with walnut inlay. 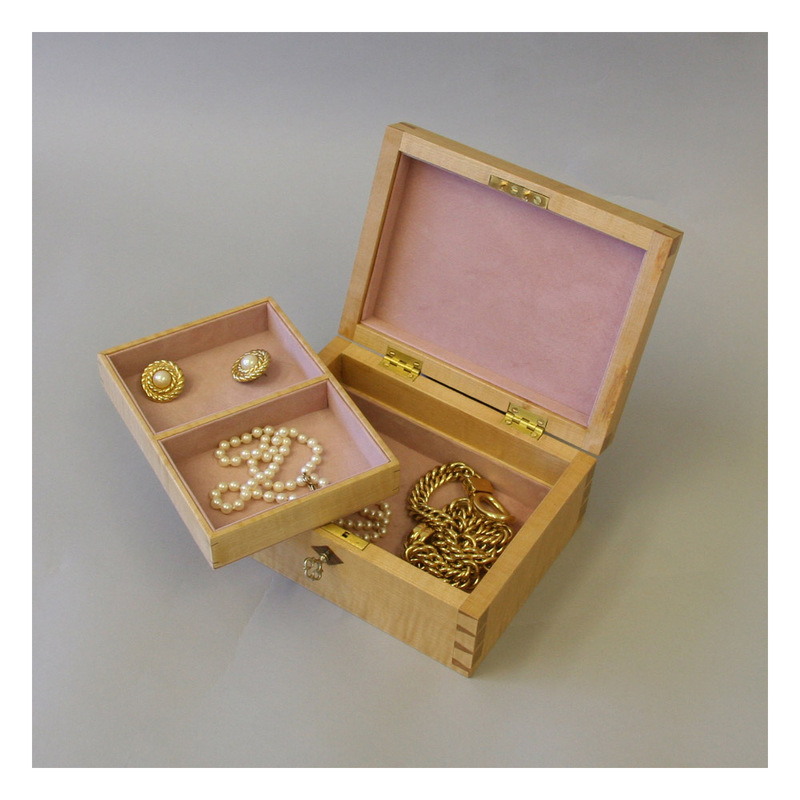 The interior of the jewellery box as lined with pink pig suede. 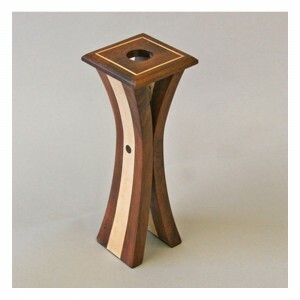 This candlestick (one of a pair) is made of Madagascan rosewood and sycamore. 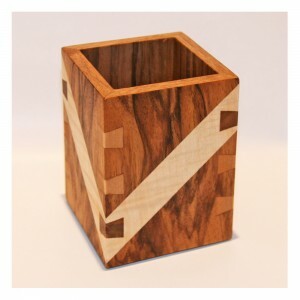 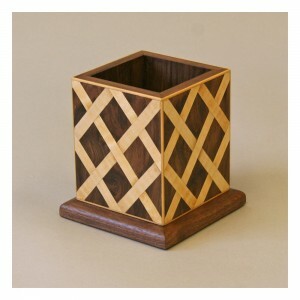 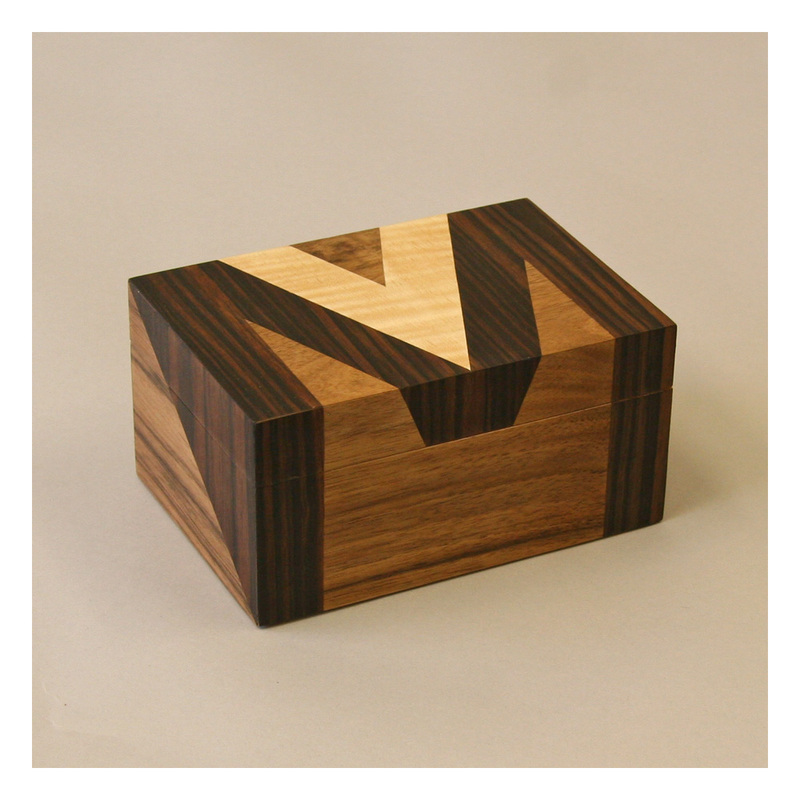 A small pencil holder veneered in walnut and ripple sycamore with contrasting dovetail keys. 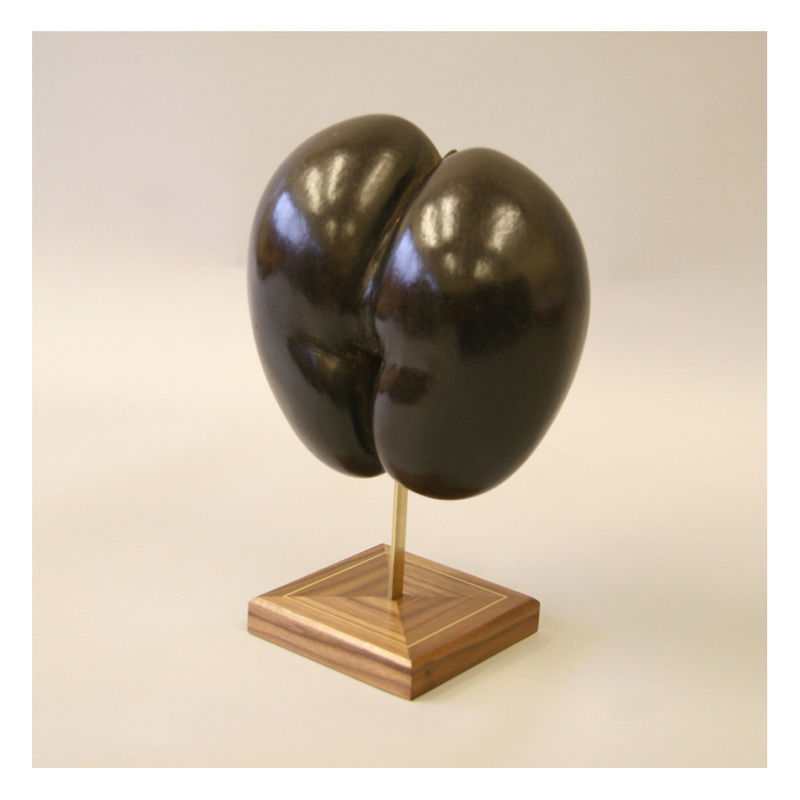 An unusual commission – a stand to support and display a fine old Coco de Mer seed. 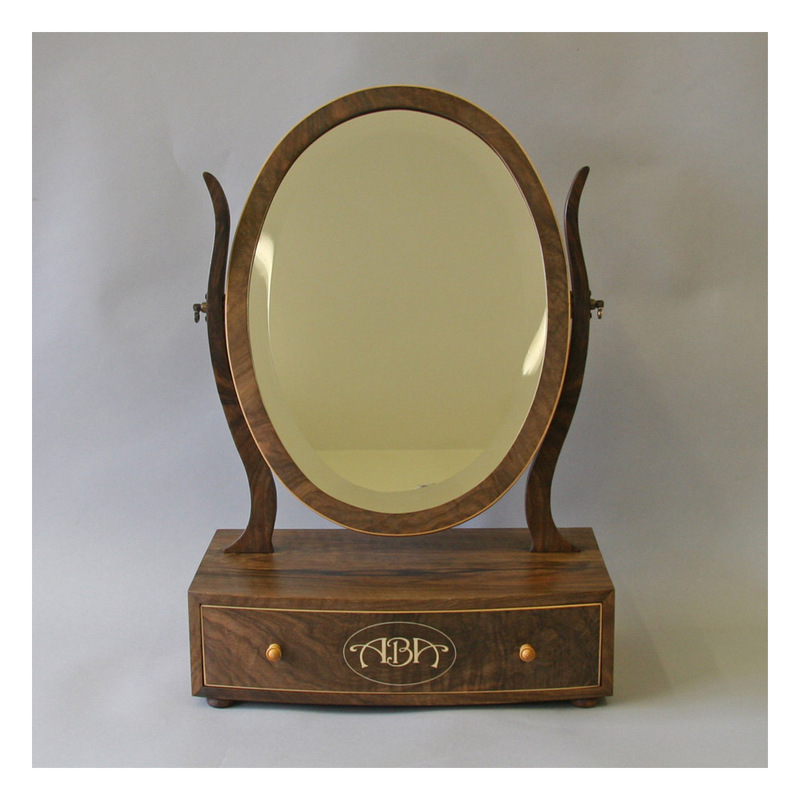 A walnut dressing table mirror commissioned as a Golden Wedding Anniversary present. 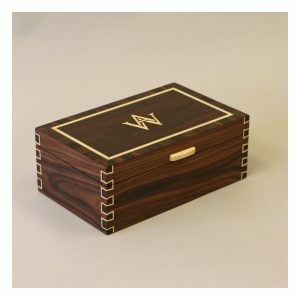 A box for playing cards made in American black walnut. 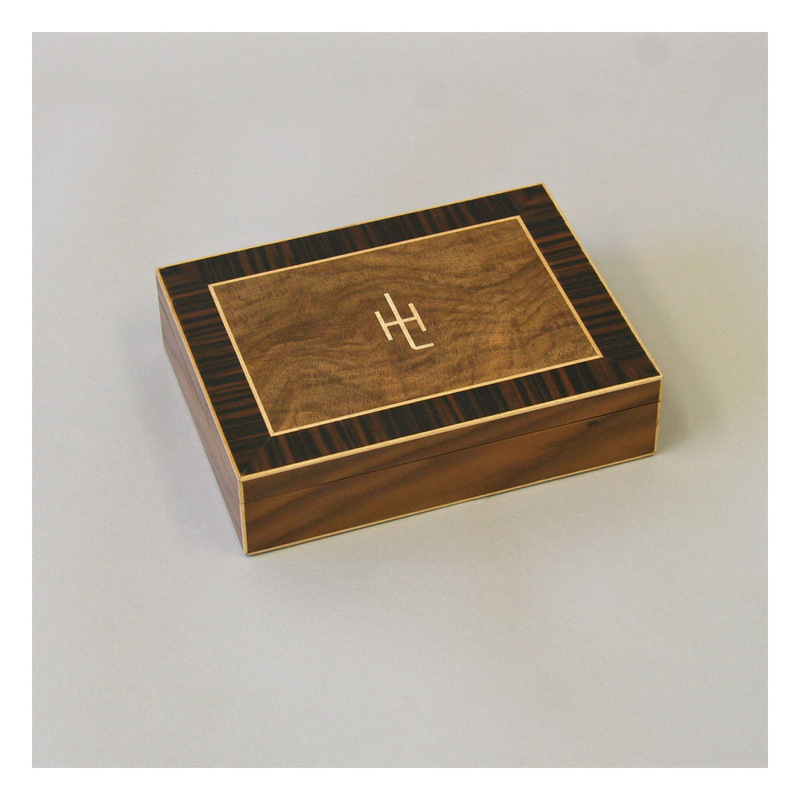 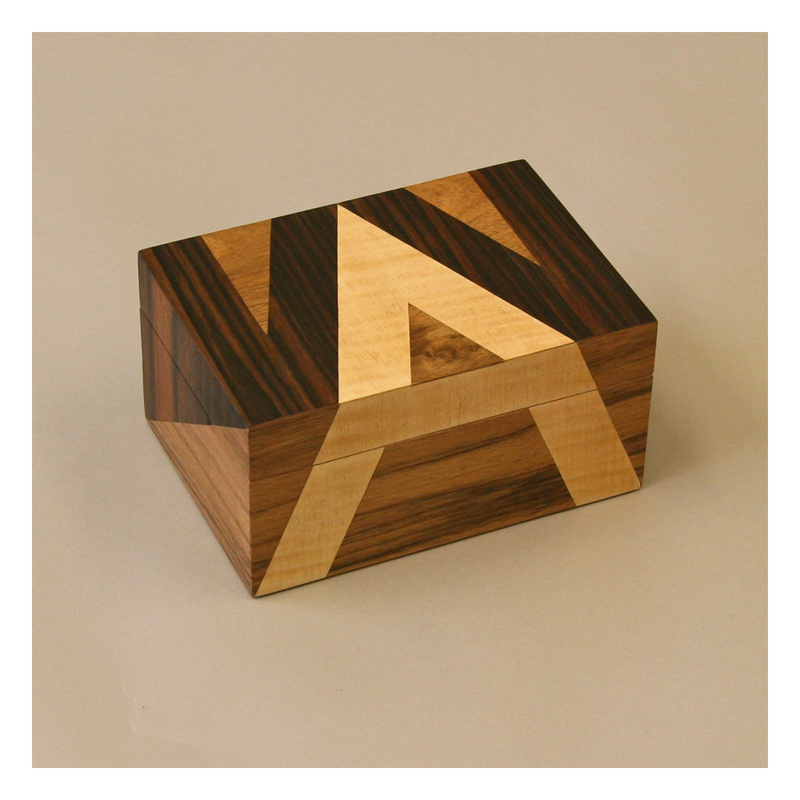 The lid of the box is veneered in burr walnut, with Macassar ebony crossbanding and sycamore inlay. The inside of the card box showing the removeable maple tray which holds the cards. 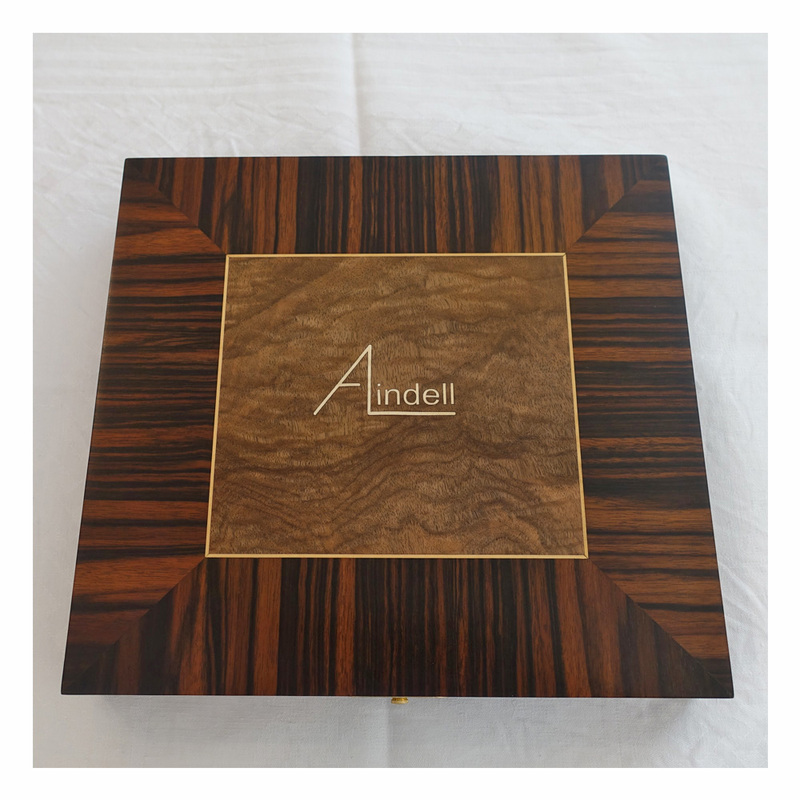 A jewellery box in American black walnut with African ebony inlay. The interior of the jewellery box is lined with navy blue pig suede. 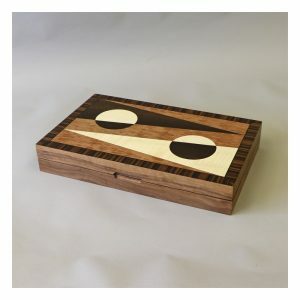 A jewellery box in bird’s eye maple with Macassar ebony inlay. 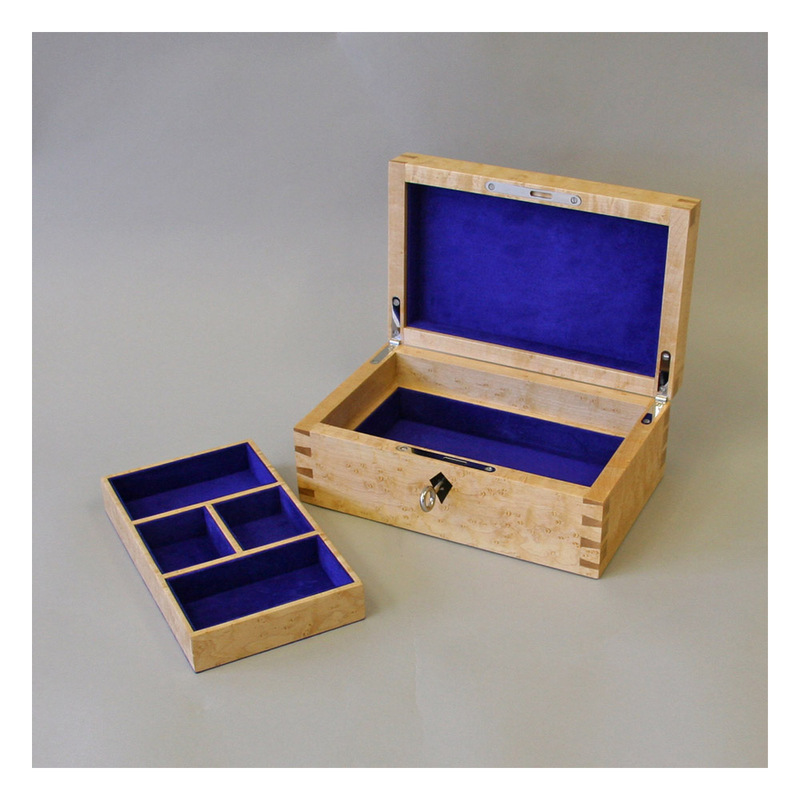 The interior of the box is lined with cobalt blue pig suede. 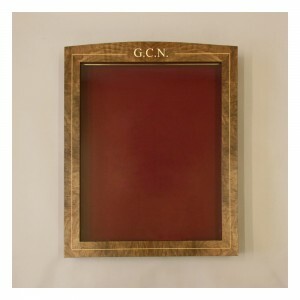 A wall-hanging medal display cabinet. The cabinet is veneered in burr walnut with sycamore and maple inlay. 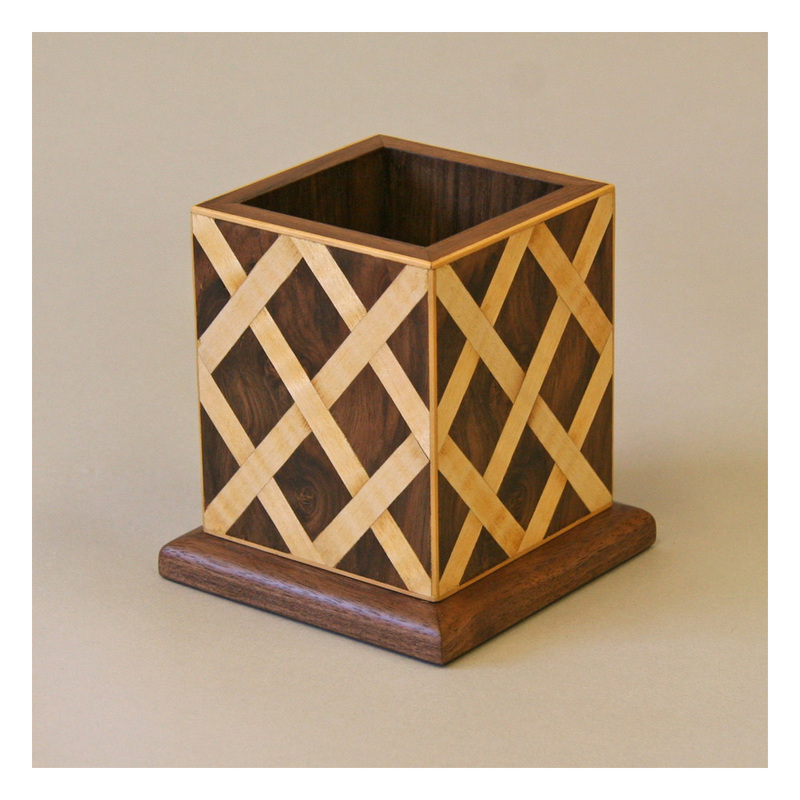 A pencil box in burr walnut with sycamore inlay in an open basket weave pattern. 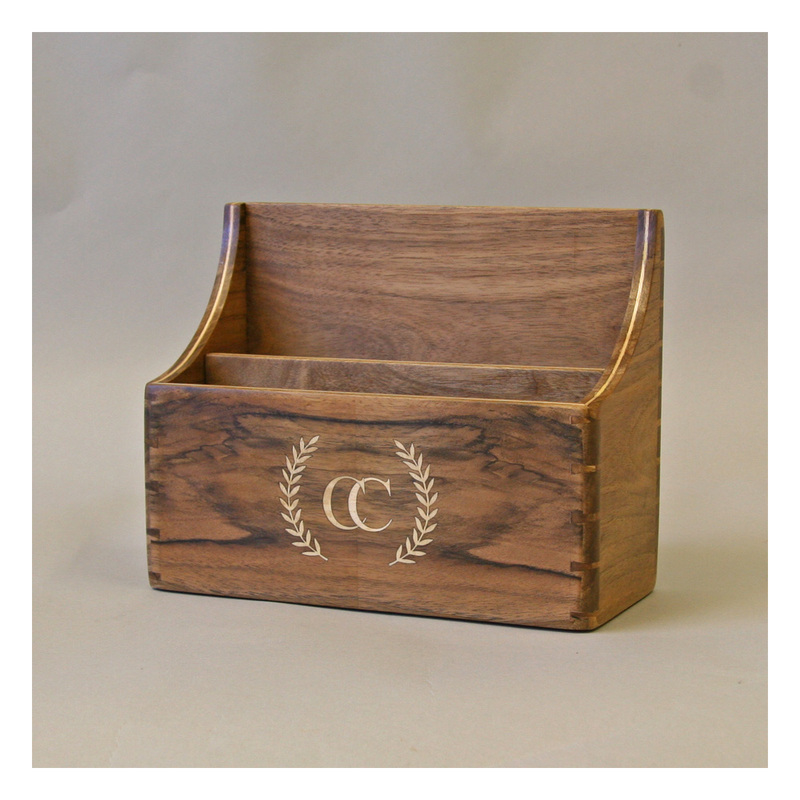 A personalised letter rack in European walnut. A desk chair in American black walnut with Macassar ebony and sycamore inlay. A small bedside shelf, one of a pair, in burr walnut with box stringing. 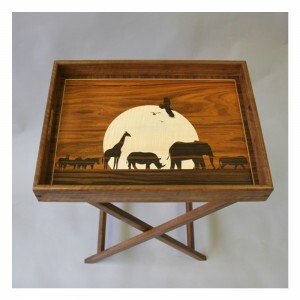 A butler’s tray made for a South African safari lodge. 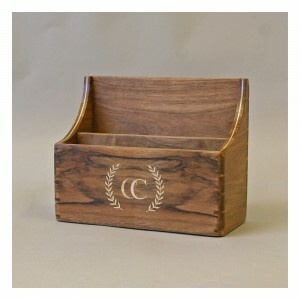 The tray and stand are made of American black walnut. 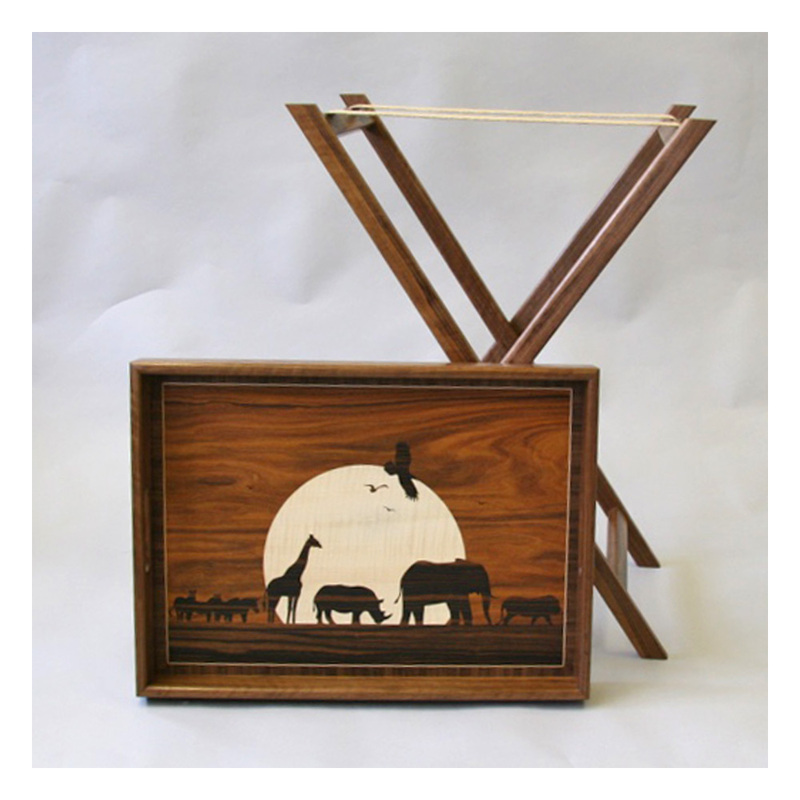 The safari scene is composed using Santos rosewood, ripple sycamore and Macassar ebony veneers. 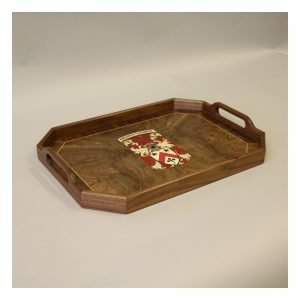 The butler’s tray with the tray removed from the stand. 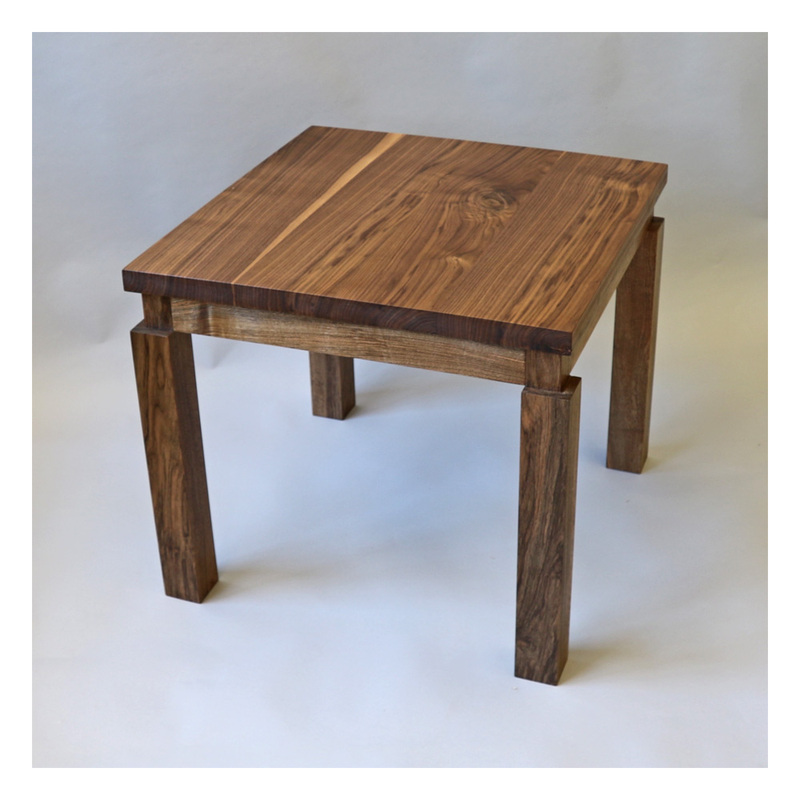 One of a pair of walnut side tables. 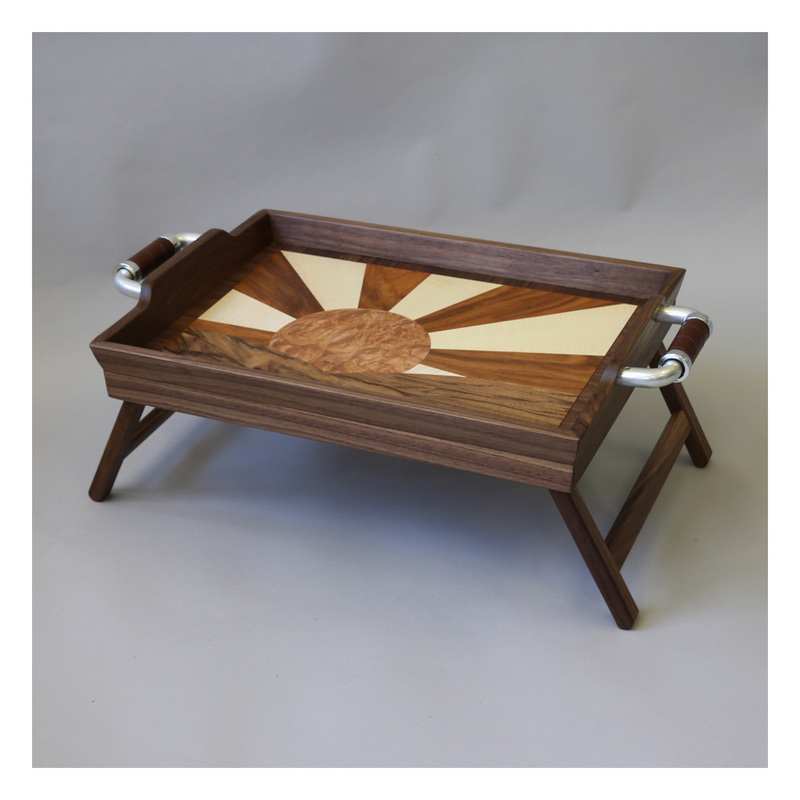 A breakfast tray in American black walnut with an inlaid base. The legs of the tray fold away when not in use. 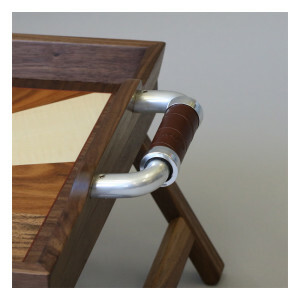 The handles of the breakfast tray are designed to feature leather bicycle grips. A campaign-style drinks box. 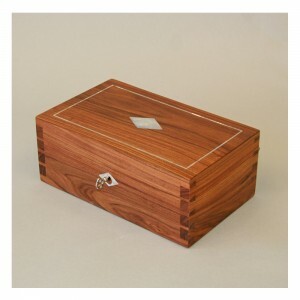 The outside is veneered with book-matched European walnut and has box edging. The drinks box has a drop-down front with a leather top. 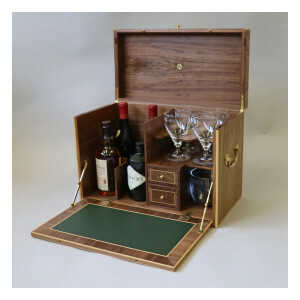 The beautiful glassware was supplied by Jojo Glass Design (www.jojoglassdesign.co.uk). 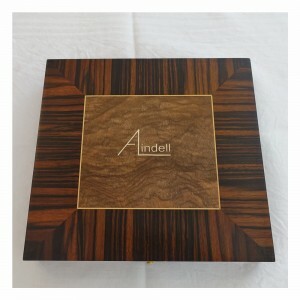 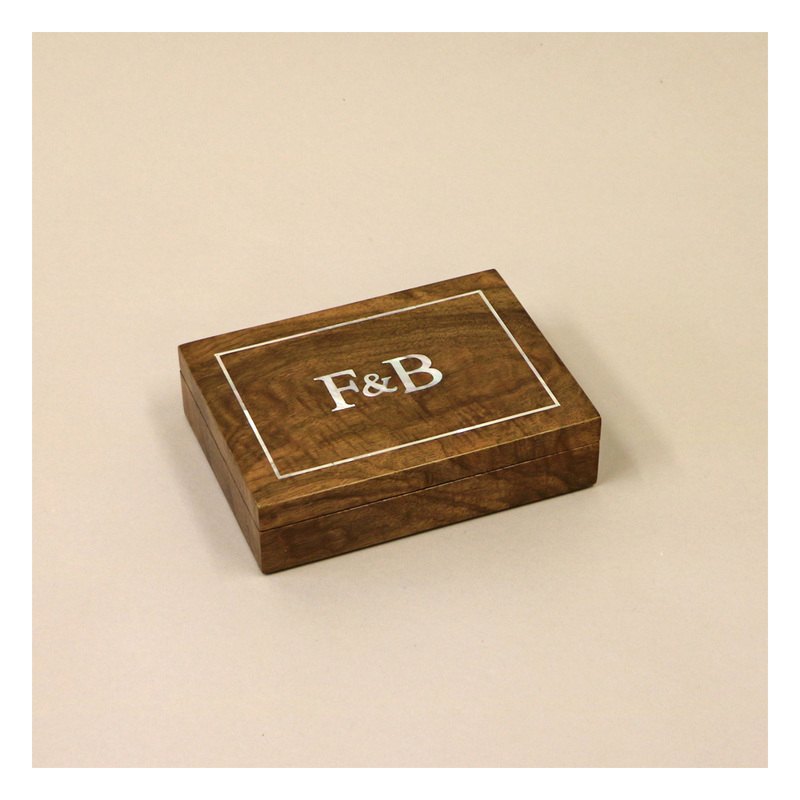 A personalised knife box veneered in Macassar ebony and burr walnut with box stringing. 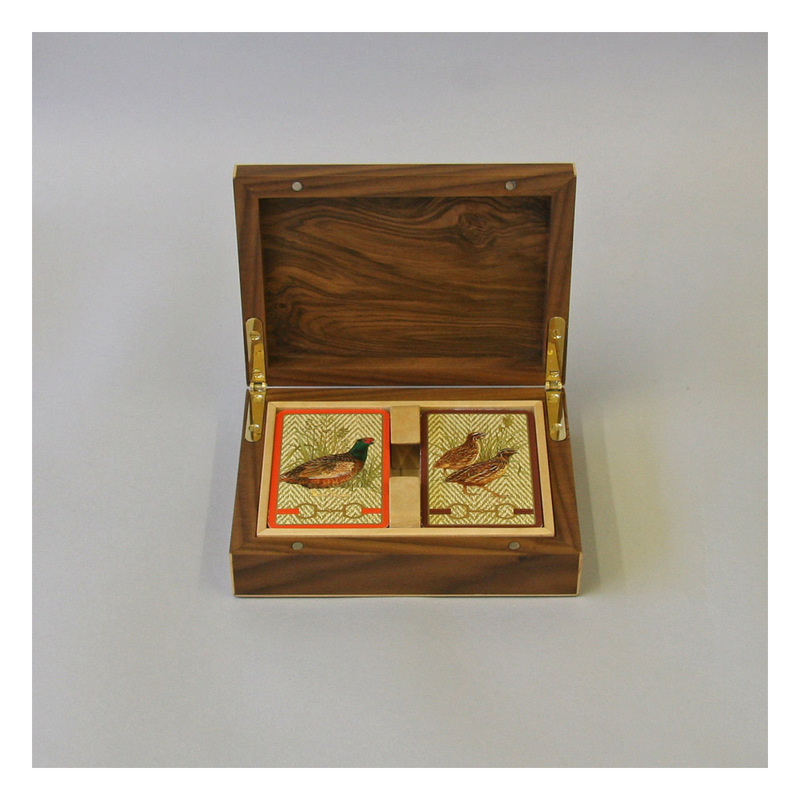 A card box made of padauk wood veneered in burr walnut and inlaid with mother-of-pearl. 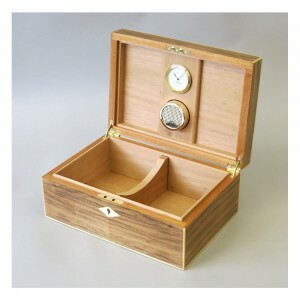 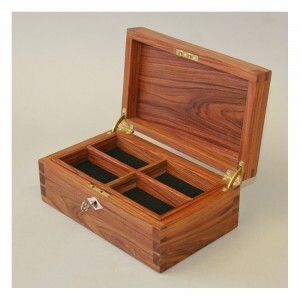 A valet box (for a man’s bits and pieces) in Santos rosewood with maple inlaid dovetails and other detailing. 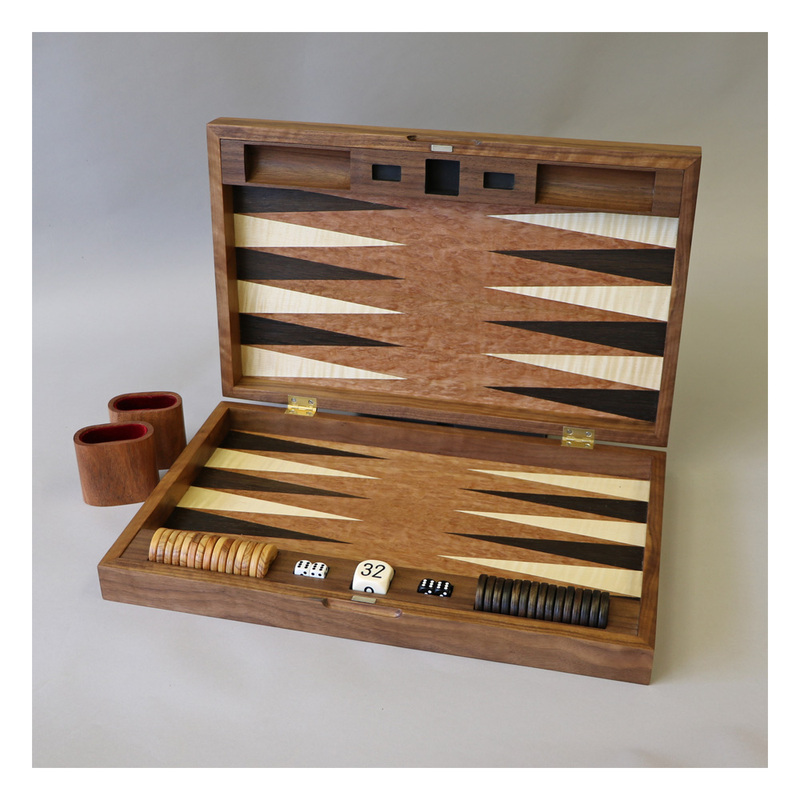 A backgammon board made of American black walnut inlaid with pommele eucalyptus, fumed oak, sycamore and Macassar ebony veneers. 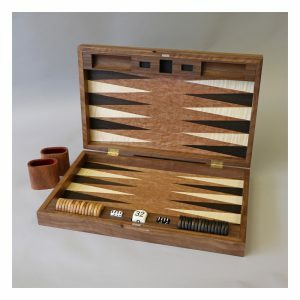 The inside of the backgammon board. An octagonal walnut tray with inlaid family coat of arms. 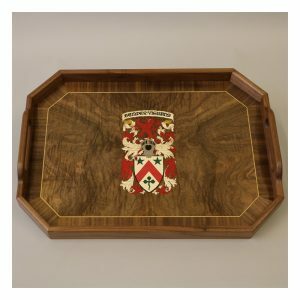 A better view of the coat of arms – wonderful work by Joe of Heritage Inlay Design Ltd. (www.inlays.co.uk).